We had a meeting recently. One of many. Too many to count. And we discussed the problem on the table. The one of worry. I shared of how it comes in the night sometimes. And that capturing the thoughts is harder than putting active preschool twin boys to bed on time. They don’t want to settle down and just go to sleep. Worry is a wild toddler running through the aisles of Walmart. Its like picking up the headphones at the UN to listen in and you pick up the wrong ones. The words keep coming, you wrestle, but cannot take them to the mat. The thoughts filled with worry. You cannot glean understanding and crack the code to the gnawing nagging gibberish. Three a.m. is not a good time to translate worry into a cogent plan, wrapping understanding around a problem. And at the meeting I apologized to them, the Trinity. They were there, are there. Lovingly listening. Listening in love. I pour out my confession of my I know we’ve been through this before. This letting go of worry. And there is nothing worse and its not of Him. And yes we often go back to Release It To Me 101. And how in this world do you solve a problem at three a.m. or any time of day or night without this highly esteemed omnipotent One who is available to love you through the thick fog of worry. All you long to do is find the cold side of the pillow and snuggle like a pea in the pod of fluffy white down comforter and crisp clean sheets but worry runs roughshod over you like raging bulls. Letting go of worry means capturing the thoughts and ushering them out of the mind’s door, saying nice try you wile ones, you are out of here. You have no place in this life abundant, life transforming, life renewing. Life set free. And tomorrow night, the cool side of the pillow will hold the sleepy head and worry will be released in a pre-bedtime moment. She’ll capture and release the foggy cloud of worry and let it go like fireflies in the night. Good night my Day, you were good to me. Hello my Night, I am glad you are here. Sleep tight, good night, don’t let the bed bugs bite. And The Lover of Her Soul ushers her off into the land of wink-n-blink-n-and-nod. And worry is no more. Click on the Tab on the homepage entitled 31 Days to journey through this series, the collective. Or simply click here. I am joining The Nester for the month of October and Shelly Miller at Redemption’s Beauty today for her series entitled Letting Go. Joining Beholding Glory dot com on this Friday too. I found this so encouraging! It’s an unwelcome bedfellow, this worry that slips between the sheets about the time you drift off into peace, isn’t it? 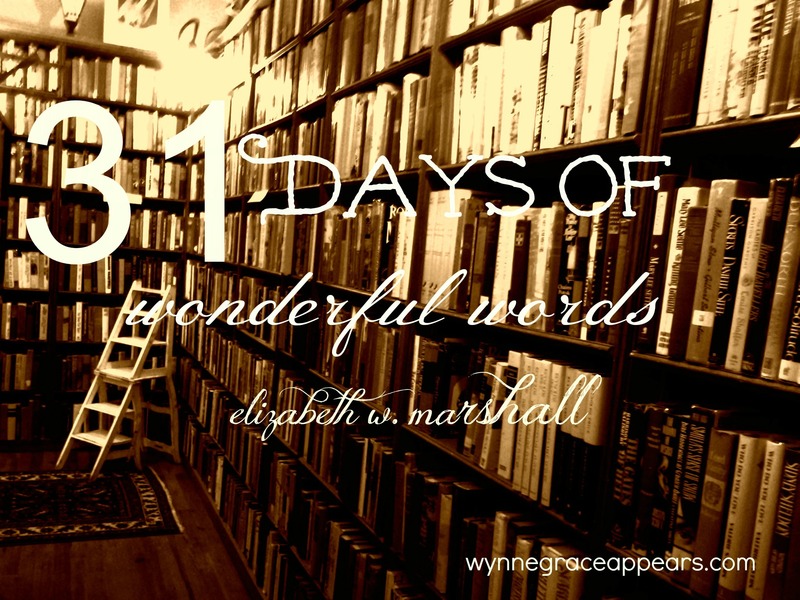 Thanks for linking up in the comments Elizabeth, and for all your encouragement. You have a lovely, generous heart. It is hard sometimes to not worry. finances are an issue, childrens lives are an issue, heart breaks and wounded souls, our world in general. Not sure if I actually worry so much as stop asking for the answers. You challenge me today. Elizabeth, you made me cry. Your words are a balm in this gaping wound. That is all. Oh, sister. You echoed my own process today and brought such beauty with it. Your voice dances and healing is on the wings. Peace to you, friend. Worry is the worst of thieves, nasty and hateful and plotting. And the only antidote is grace. Praying for grace to flow into the crevices broken open by worry.